The 5th iteration of the venerable Street Fighter franchise is set for a release on the 16th of February 2016 but for those who could not wait till 2016 could get their fight on at the PlayStation booth. 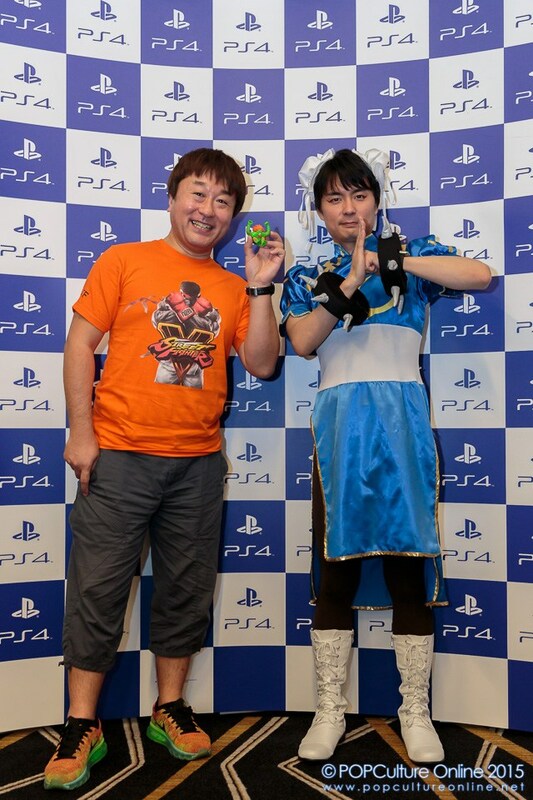 Not only was the game available for play in the PlayStation booth, producers Yoshinori Ono – with his signature blanka toy and Tomoaki Ayano – who wore a Chun-Li costume and for the first time ever, his Chun-Li costume came complete with her signature white high top boots, were also at GameStart 2015 to reveal the new Tutorial Mode – a mode that’ll tutor new players the most basic of basics. We were able to sit down with both producers and ask them about the rationale behind Ken’s new style and how they kept each iteration of Street Fighter unique. Street Fighter has been one of the cornerstones of the 2D fighting genre, how do you keep things fresh while still keeping the elements that made it such a success in the first place? First off, the most important thing is to hand off the old Chun-Li costume to Ayano-san -laugh-, so I’m getting rid of the old and now he can start anew with a fresh new idea -laughs-. So the basic principle of Street Fighter is a 2D game and that’ll never change even if there is an implementation of pseudo 3D graphics. In essence, the core pillar of the series would be 2 people fighting each other on a 2D plane. Anytime we switch to a new game, we want newcomers to face off with those that already have experience in Street Fighter. For example, in 3rd Strike we had the Parry system, in Street Fighter IV we had the Focus Attack mechanic and in the new version we have the V-Skills. That way we want players to have an even playing field where all the players would start from zero but we can meet together in play on a equal playing field. What was the rationale for the radical design change for Ken? Just like Ken and Ryu, we want to have the old characters there but remake them, the whole point of this is to get everyone, no matter what your experience level is, to start from zero and we can’t do that without changing a lot of fundamental things but we’re still going to keep the essence of the character but change the way that they move. It is important to reset everything to zero because it forces everyone to hit the training room and start to research and practice on their own. By changing the way he fights, veteran SF players could not just rely on their own experience in the previous game, everybody has to start from the same starting line. Would we see Street Fighter V display more advanced data such as Hit Boxes and Frame Data which was absent in the previous iterations? I recognise that this kind of data would be very convenient for players however if you think about the Street Fighter IV series, hurt boxes would shrink and expand, and also the active frames will change so until that frame data calms and settles down; I don’t really see a point in implementing this new feature. Furthermore for Street Fighter V, they want everyone to start from zero so to put that information out there isn’t a really good choice because I want everyone to go into the game and explore all these information by yourselves. What inspired the design for the new character such as Laura and Rashid? For the new characters, the first two things that we approach internally are the visual appearances of the characters and what type of movements we would like for the characters. With these two factors in consideration, we would flesh out the characters. Recently, a new consideration has been added in that is regional importance; for example, Laura comes from Brazil and Capcom understands that the region is a huge gamer market so we decided to make a character for that region, the same thing goes for Rashid for the Middle East. So these 3 things are the basic tenets when they are designing new characters. Going back to the concept of starting fresh, what can players expect from Street Fighter V, besides the already announced V-Skill system? A new feature we’re announcing here at GameStart would be the Tutorial mode which is really going to play into the concept of bringing in new players in, the mode will teach new players the very basics of the game such as how to do a light punch or a light kick or even how to block. These are things that perhaps some other people take for granted but the new Tutorial mode is really going to be catered to new players. I want to make it very clear that the Tutorial mode and Training mode is two different modes. 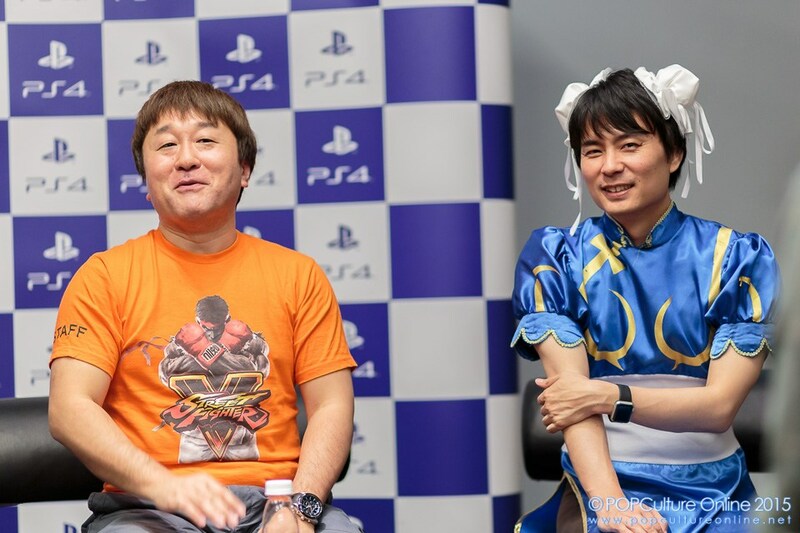 Thank you Yoshinori Ono-San and Tomoaki Ayano-San for your time.